If you’re already juggling the needs of a big family or struggling to pay the bills on time, the dental care you need is often easy to push further and further back on the list of priorities– but it doesn't need to be! 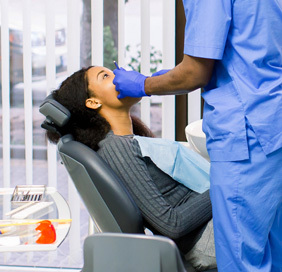 Here in Lathrup Village, MI, Affordable Dental Care wants nothing more than to help you and your family achieve optimal oral health in an environment that’s inviting, comfortable, and, as our name suggests, completely affordable. Whether you’ve got insurance or not, we’ll help you get the money you need to pay for the dental care you deserve. Better yet, we’ll be sure to select the treatment from our menu of dental services that best fits your unique needs and concerns. Let our team do all the hard work when it comes to you and your family’s pearly whites! Prevention is critical when it comes to keeping your smile healthy, and we’ll be sure to treat it that way with our general and family dentistry services. You and your family will begin your care with us by undergoing a thorough check-up and cleaning so that we can determine the scope of any dental problems or damaged areas. What if we do find something? Don’t worry – we offer several personalized therapy treatments for several common oral health issues, including gum disease, bruxism, TMJ disorder, and much more. Are you dealing with teeth that are chipped, cracked, severely damaged, or even missing altogether? Leaving these problems untreated for too long can have dire consequences for the rest of your smile, which is why we offer a variety of restorative dentistry services that can help restore both form and function to your smile in a natural-looking manner. With an onsite dental implant specialist, we can even offer every step of the dental implant process here at our Lathrup Village office for patients who’ve lost one or more teeth. Cosmetic dentistry procedures are often a great option for patients who’d like to improve the beauty of their smiles. We can seamlessly fix a wide variety of dental flaws, from chips and cracks to stains and discoloration. We even offer the services of an onsite orthodontist, who can help correct gaps and misalignments with excellent options like Invisalign! Contact Affordable Dental Care today to schedule an appointment! We’re happy to offer emergency dental care, same-day appointments, and countless financial options to patients in need of friendly and comfortable services for their smiles. We serve the areas of Lathrup Village, Southfield, Birmingham, Oak Park, Ferndale, Madison Heights, and beyond.